It didn't take long for Twitter to react to the reports that pharmaceutical executive Martin Shkreli had been arrested on Thursday morning. Many Twitter users delighted in the news that Shkreli, a former hedge fund manager turned biotech bad boy, had been indicted for securities fraud charges related to his time as CEO of Retrophin. Shkreli was fired last year by Retrophin (RTRX), a company he had founded. Retrophin has accused him of using the company's stock and cash for his own personal gain. Shkreli has denied those allegations. But he became a household name in September when his new firm, Turing Pharmaceuticals, announced it was raising the price of Daraprim, a drug used by AIDS and cancer patients, from $13.50 a pill to $750. Shkreli was instantly demonized by the media and politicians. Hillary Clinton railed against Shkreli, saying he was guilty of price gouging. She later called Shkreli's suggested 10% price cut of Daraprim to be "insulting." But Shkreli, who is also very active on Twitter, dismissed a retweet of Clinton's criticism with a popular Internet acronym. Shkreli seemed to relish his villain status on Twitter. His feed is full of tweets where he defends his actions, boasts about his stock picking prowess (shares of another small biotech called KaloBios (KBIO) surged after he recently took it over) and attacks his detractors -- most notably Clinton and Bernie Sanders. And these were the last two tweets Shkreli wrote before Thursday's indictment. So it shouldn't be a big surprise that many on Twitter were giddy about Shkreli's indictment. 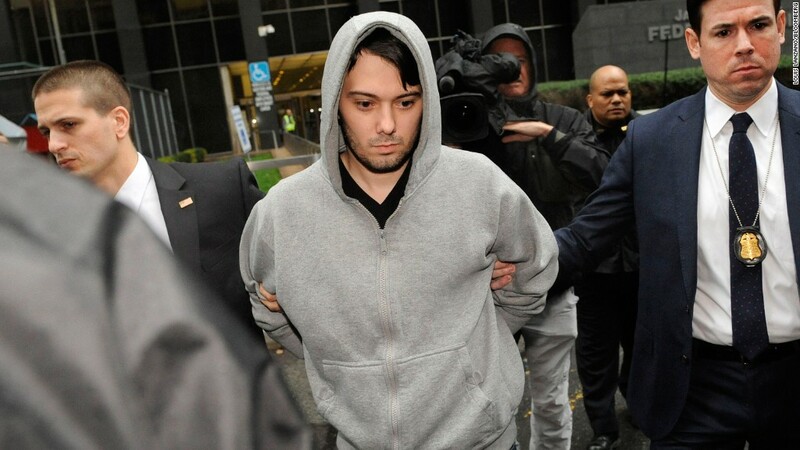 The images of Shkreli's arrest -- in a grey hoodie to boot -- delighted some Twitter users. I've been off twitter for a couple months, but the arrest and perp walk of Martin #Shkreli made me jet back. I'm not Catholic but I'm racing to a confessional. This jig of glee I'm doing over Martin Shkreli's perp-walk pics can't be right. Several others joked about whether Shkreli would apply his pricing tactics in prison ... or if fellow inmates might turn those practices against him. Can't wait for Martin Shkreli to try to hike the price of prison cigarettes 7000%. Martin Shkreli: yo, I need protection. That's 2 cigarettes right? Bubba: now it's a carton. MS: WHAT! B: Economics, man. Many made light of Shkreli's recent purchase of the sole copy of an album by rap legends the Wu-Tang Clan for $2 million. I wonder if the folks at the U.S. Marshals Service asset forfeiture unit are Wu-Tang Clan fans? The FBI's New York Field Office made clear they did not confiscate the album, saying on Twitter there was "no seizure warrant at the arrest of Martin Shkreli today, which means we didn't seize the Wu-Tang Clan album." One person went with another musical reference, Karma Police by Radiohead, to express his thoughts on Shkreli. People also noted how ironic it was that Shkreli recently said he wanted to bail out rapper Bobby Shmurda, who's in jail on charges of conspiracy to commit murder -- among other things. SHkreli & Shmurda can livestream from same cell together? But others thought that the overwhelming sense of schadenfreude (or schaden-"fraud" as many dubbed it) may have been a bit much. Shkreli, after all, does deserve his day in court. There even was a @FreeShkreli account that popped up Thursday morning shortly after the news broke. Although it's hard to tell if it's meant to be satire or a legitimate call for Shkreli to be let go. One tweet linked to a page set up on crowdfunding site GiveForward to help pay for Shkreli's bail. At last check, one person had donated $5.